A generous scoop of French Green Clay is added into the sponge for a soothing and extra mineral rich red clay is added for care of the dry and more mature skin types. French green clay is used at the finest spas. It contains micro molecules which absorbs dirt, oil, and bacteria, while gently cleansing the pores. Green Clay has been widely used as an effective facial cleansing cream for a long time since it has very strong sterilization function. Perfect for oily to normal skin types. 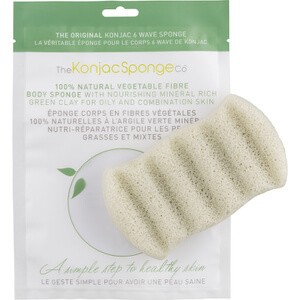 The 6 Wave Konjac Body Sponge is designed to gently exfoliate the body and soothe and cleanse all over! Gently exfoliating and sloughing off tired dead skin cells and helping reduce blemishes, ingrown hairs and generally keeping the skin in tip top condition. Your skin will feel smooth, and supple after use. No tightness or dryness.